Midway through Reservation Road, grieving father Ethan Learner (Joaquin Phoenix) gets arrested only minutes after snapping photos while conducting his own investigation; meanwhile, the hit and run driver who killed his young son remains free. It’s this maddening contradiction that is slowly driving him nuts and even scarier it brings out his primal masculine need for revenge that’s further fueled by online research and chat rooms that illuminate the lack of justice and many loopholes found in the daunting, large number of unsolved cases that are stockpiled in police departments across the country. Simply put, after so many dead ends, the most likely way that the man will ever be caught is if he turns himself in. 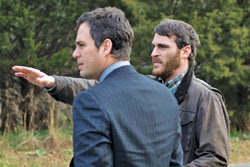 As the conflicted driver who rushes home to bring his son back from his court mandated custody weekend to ex-wife Ruth (Mira Sorvino), Mark Ruffalo does some truly impressive and introspective work as the tortured Dwight Arno who fails to do the right thing by stopping after his large SUV hits young Josh Learner on deserted bendy Reservation Road. Instead, Dwight hides his vehicle and toys with the idea of turning himself in but, scared of a prison sentence and the prospect of losing his son, hides in plain sight until his path crosses Ethan’s again. Based on the 1998 novel by John Burnham Schwartz and adapted by both Burnham and Hotel Rwanda director Terry George, the co-scripters do a good job of establishing the setting of the small close-knit Connecticut town and moving the events so that they coincide with the 2004 World Series that found this year’s victors The Boston Red Sox again in the race for the championship. A first rate cast of actors including Jennifer Connelly as Grace Learner and John Slattery as Ruffalo’s supervisor do their best to live up the at times surprisingly uninvolving and coolly executed storyline after all plot twists and character revelations are offered up within the film’s first thirty minutes. Thematically similar to Connelly’s far superior House of Sand and Fog which was much more devastating in its race to a violent conclusion, the end of George’s Reservation Road careens quickly along in a way predictable to anyone who had the misfortune of seeing the overly explained theatrical trailer but after a giant scene of emotional intensity that shows off the talents of Phoenix and Ruffalo, we’re left with a vague and rushed ending that had an audience member venting to me afterwards in confusion and frustration, and wanting to clarify our ideas during the exit which is never a good sign. Perhaps it played out better in literary form but it seems that finally the characters in Reservation Road are given the opportunity of finding closure or (if you're so inclined), at the very least finally facing the hopeless music by the film’s end, yet for those of us watching in the theatre, we’re left with a slight sense of incompleteness and manipulation that affects the way we then go back and evaluate some of the earlier scenes.